Ontario's ONLY Point to Point Trail Race! The Bad Thing trail race is the ONLY point to point trail race in Ontario. It takes place in Huron County, Ontario along the stunning Maitland Trail. The race ends at the Auburn hall (heated building, yay!). The 50K option starts in Goderich and ends in Auburn. The 25K portion starts roughly at the half way point of the 50K race course (see route details below). The race consists mainly of single track, highly technical trail with a small amount of road and groomed trail along the way. Participants should be prepared for very technical, potentially muddy, tough terrain. This race is not for inexperienced trail runners. 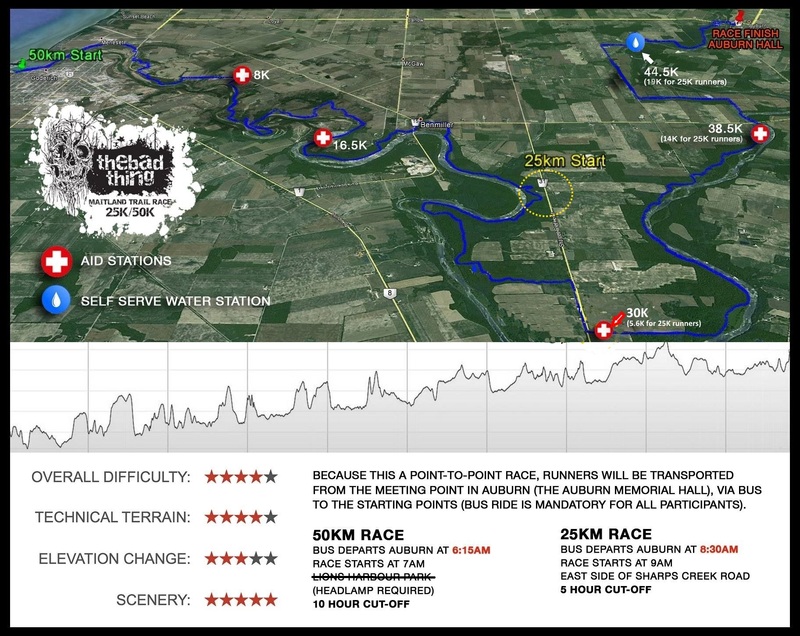 Because this a point-to-point race, runners will be transported from the meeting point in Auburn (the Auburn Memorial Hall), via bus to the starting point in Goderich. Please meet at the Auburn Memorial Hall no later than 6:00am to check-in. The bus will leave Auburn at 6:15am sharp for the 50K option and 8:30am sharp for the 25K option. The bus ride is mandatory for all participants, as race brief, and rules will be gone over on the ride. No one will be permitted to race unless they meet in Auburn to check in first, and ride the bus to the start. **Minimum age for participants is 18 years old. 50km Race: Runners will start at The Lions Harbour Park [Mystery Location] in Goderich, head down the Lions Park stairs, behind the grain elevators and onto the G.A.R.T (rail trail). Runners will then travel along the entirety of the Maitland Trail, finishing at the Auburn Community Hall in Auburn. 25km Race: Runners will start on the North Side of Sharps Creek Road roughly 5.6K from the Sharps Creek Aid Station. Exact start Location will be revealed race day. **2016 Course Change Notice for 25K: The spur near Heron Line (5.6K spur) has been removed and an initial 5.6K of trail has been added to the start north of the Sharp’s Creek aid Station. I.e. more trail, less road!